"I'm Coming Home With My Head Held High"
Back in Texas, now former president George W. Bush, spoke to his true believers. The only major news channel to carry the speech live was Fox News. All the others were distracted by something happening in Washington DC. "He SHOULD return home with his head held high. His accomplishments will only be realized in the history books of our children and grandchildren. Thank you, Mr. President. You made me feel like a true U.S. patriot. Good job, sir." "thank you BUSH may you be safe welcome home." "America did not deserve someone of your characte, Mr. Bush." "Thank You President Bush for putting America first and popularity last. You will be missed. I just hope we survive these next four years...."
"I'm thankful for our safety, tax cuts and two new conservative justices on the Supreme Court. 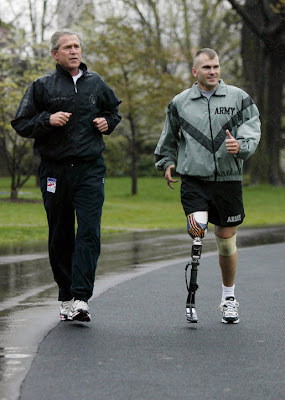 Thank you President Bush." On his last day as president, he had a typical morning at the White House, according to departing White House Press Secretary Dana Perino. He spoke with outgoing Secretary of State Condoleezza Rice and other aides, then took a walk around the White House grounds. I've been thinking for months about what kind of post will best sum up the Bush presidency on this day, the last day of President George W. Bush in the White House. It was only going through my blogs' archives, for another story entirely, that I stumbled across something that perfectly sums up the Bush presidency for me. Something written as fiction that became fact. "You better believe we're going to mix it up with somebody at some point during my administration," said Bush, who plans a 250 percent boost in military spending. Is it over, then, for The Last Days Of President George W. Bush blog? I have a few dozen story notes and article excerpts on Bush in draft that will pop up on this site, but not as new stories, when I get around to finishing them. That work is not exactly a high priority right now. But I will be doing a couple of round-up posts of stories from this blog, from the past couple of years, in the weeks to come, to remember what exactly it was we lived through. And I will come back here to update when there is news of particular interest about Bush, and in a couple of months I will write a Looking Back At Bush essay here. If you do the RSS for this blog, any new posts should pop up there. And, if Blogger doesn't disappear in the meantime, there will be a day when I come back here to write about the death of former US President George W. Bush. If he goes back to hitting the booze as hard as he did in the 1970s, that day won't be too many years into the future. As I write this, Bush is preparing to head back to Washington DC, from the ranch in Crawford, Texas, and he will soon shake the hand of President Barack Obama, and then head for Andrews Airforce Base, where he will ride a plane stripped of its official title - Air Force One - back to Texas. 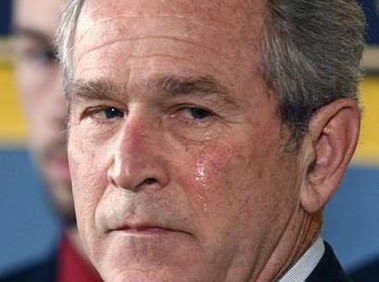 Bush won't return to Washington DC again, in any major way, until the real investigations of criminal behaviour in the Bush White House get underway late this year, or early next year, if he bothers to front the hearings. I started this blog because I thought it would be a good way to keep track of the scandals and mindfucking news that seemed to flow almost daily, back then, from the Bush White House. They were involved in some serious reality-warping and redefining, and I needed to write about it to make sense of it. I also thought there might be a book in it all, one day. I think now it will have to be a science fiction novel, instead of a non-fiction book, there are already too many of them about Bush, and this blog will prove very handy as a refence tool for any novel like that I may end up writing. Doing this blog didn't exactly work out the way I wanted it to. It should have been daily updated, but sometimes it wasn't updated for six or seven weeks at a time. 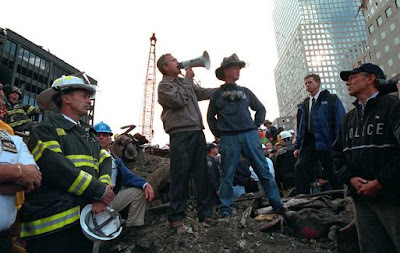 I missed whole months of President Bush history because, well, I had better things to do, but I got down most of what I wanted to write about those days. And writing about it did help greatly in making sense of it. And how interesting it is to write those words in regard to Bush : Those Days. Those Last Days Of President George W. Bush. UPDATE : I just found this, again looking through the blog archives for something else. It's from January 2007. Wouldn't You Cry, Too? Bush has made 77 visits to his ranch in Crawford during his presidency, and spent all or part of 490 days there. Bush said he really "wanted to change the tone in Washington." Maybe he could have changed that tone if he'd spent just a little bit more time there, in the nation's capital. I'm not sure what the full impact of video sharing sites like YouTube have had in total on the presidency of George W. Bush. But put it this way, they certainly haven't helped him. Not at all. “The notion that somehow I was pulling strings or making presidential-level decisions. I was not,” he said. Which is Cheney's way of saying: "Don't look at me, I didn't do it!" George W. Bush's "after-life," as Laura Bush calls the post-presidency, is shaping up to be pretty comfortable, with a Dallas office, staffers, Secret Service protection, a travel budget, medical coverage and a $196,700 annual pension, all at taxpayers' expense. The Bushes will move to their new $2 million , 8,500-square-foot Dallas home — not paid for by taxpayers — on Jan. 20 , and there Bush will be close to his future presidential library at Southern Methodist University . "We're working on a conceptual design for the building," said Mark Langdale , president of the George W. Bush Foundation . The president will help develop the $300 million structure, which will include a library, museum and policy institute. Fundraising is just beginning, Langdale said. Construction will be paid for with private funds, and Bush is expected to be involved in organizing the fundraising drive. Bush made a lot of his old friends in the US War Industry richer than they've ever been before, so presumably they will cough up the delayed kickbacks to fund most of the library's construction. Then again, if Bush is actually pursued very publicly for war crimes, he may find 'donors' for his library projects few and far between. Secret Service protection will only last for ten years. Bush will maintain an office nearby in space acquired by the General Services Administration, which, under the Former Presidents Act, will pay for the office suite and staff to assist him for the rest of his life. The GSA also covers travel expenses for any official activities attended by a former president, as well as two staff members. Taxpayers footed the $50,000 travel bills of Bill Clinton and George W.'s dad in 2008. And then there's the state funeral, with full military honours. Then again, it's not exactly a secret that Bush was, at the very least, an occasional cocaine user in the early 1990s. Just a little bit can give you that kind of gleam in your eye, and appealing confidence.